Hey, happy soon to be 2017! I know it’s cliche, because everyone says it, but I can’t believe 2016 is almost completed. It’s crazy. Time flies. 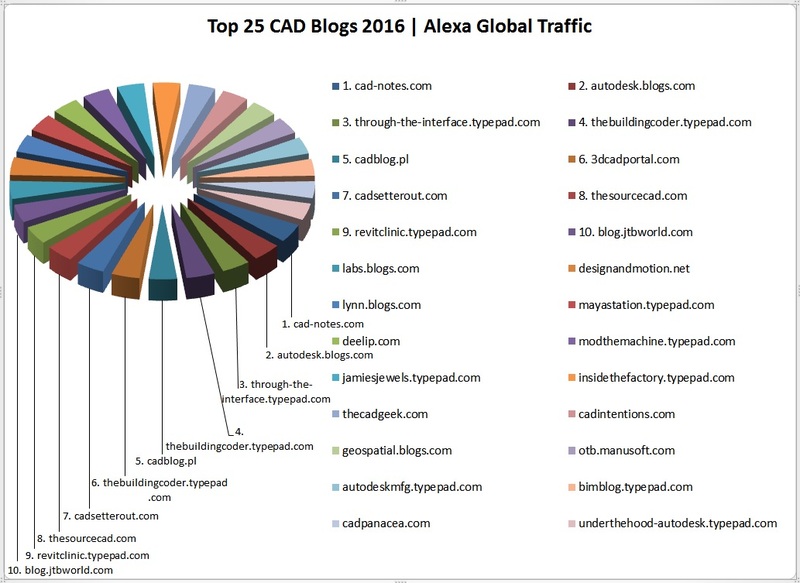 The end of 2016 brings me to my customary year end Top CAD Blogs post. I’ve been tracking some of these blogs for years now. Five years. That’s a fair amount of time. I think this post is more fun, than it is technically useful. So I hope you browse it, enjoy it, and perhaps share it. Now, let’s see who ranked where. 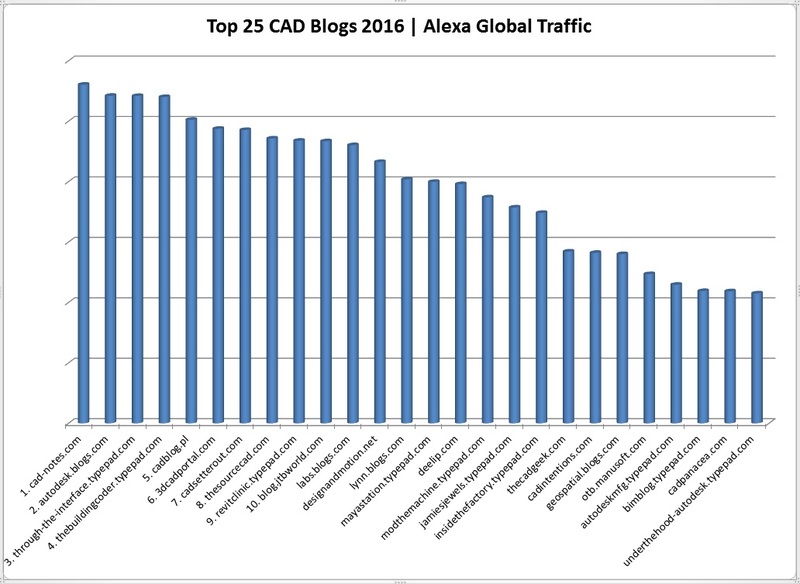 As I explain each year: I rank the top CAD blogs according to Alexa’s Global Traffic Rank. Alexa explains that their traffic rank is a measure of a site’s popularity. The rank is calculated using a combination of average daily visitors and page views over the past 3 months. The site with the highest combination of visitors and page views is ranked #1. Structured primarily as a CAD blog. This year I considered 78 blogs, but only 70 made it to my larger table format list below. This is because a number of blogs didn’t have Alexa data, so I dropped them. Here are two charts displaying the top 25 blogs. Congrats to Edwin Prakoso for his fourth year in a row as the #1 CAD Blog with his blog http://www.cad-notes.com. Congrats Edwin!! Also congrats to Shaan Hurley for his #2 placing with http://autodesk.blogs.com/. Way to go Shaan!! And congrats to Kean Walmsley for earning the #3 spot with his blog http://through-the-interface.typepad.com/. Kean is returning from his #3 spot appearance in 2014. Welcome back Kean! This is a wrap for 2016. I wish you all the best and most prosperous year of your life in 2017. If you’d like your CAD blog to be included next year, then please leave me a message in the comments below. Thanks Brandon. Same to you. Great list! All great blogs. I follow many of them as well. My website is also focused on CAD and doing well with a Global Alexa Rank of 169,915. I hope you can check it out.